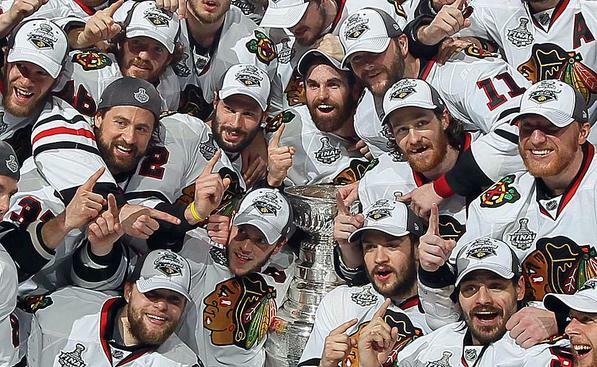 Congrats to the 2010 Stanley Cup Champs, the Chicago Blackhawks. I'll make my congratulations short. Congrats Jonathon Toews, winner of both the Stanley Cup and Gold Medal in the same season as well as the Conn Smythe. Congrats Patrick Kane, great OT goal whether or not the crowd in Philly still doesn't believe it went in. Congrats Marian Hossa, you finally snapped the curse. Congrats John Madden, you won that 3rd cup at age 37 to cap off a fine career. Congrats Duncan Keith, proved most of your doubters wrong and probably getting yourself a shiny Norris Trophy as well. Congrats Coach Q, it always feels better to win it as a HEAD coach. Congrats Jeremy Roenick, you took broadcasting to a new low. Congrats Chris Pronger, got yourself a few nice souvenirs. But now I'm starting to ramble... All I really have to say is.